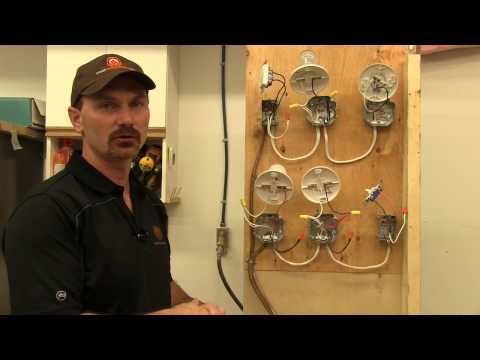 We discuss how to wire a light switch, the related cost as well as best tips to do it properly, efficiently and in all safety. If you are planning on wiring a light switch in your home you need to have a basic understanding of how electricity works and how the current travels around the house together with the various components in the circuits. There are many types of light switch available designed for various tasks and each may be wired up in its own specific way but they all follow a basic standard method. When new light switches or any other electrical components are bought, they are always supplied with a basic electrical diagram and instructions on how to fit them so there is no need to worry if you have something not mentioned here. This article will not try to take the place of the instructions and diagrams, as it is almost impossible to describe how to wire up switches without the use of a diagram, but will instead describe how to do the job in a more general way together with providing some background information on how the components work. What is a light switch? A light switch is used to turn a room light on and off from a convenient location in the room. The most obvious place for light switches would be adjacent to the door so you do not have to enter a room in the dark. The simplest scenario will be if you have one door with one switch (a 2-way or single pole switch) controlling one light fitting. The wiring connections for one switch are fairly simple as well. What happens if you have two or three or even more doors into the room? You obviously need to be able to turn the light on or off from any and all doors, or any combination. If this is the case then the switches needed would be a combination of 3-way or double pole switches depending on how many switch locations you need. We will talk about single and double pole switches later on. The mains electricity cable enters the house and immediately enters the electricity meter where your usage is recorded. This record of the electrical power you have used determines the bill sent by the electricity company. What ever it is called, its purpose is to split the electrical current and route it along various circuits within the house. The consumer unit also protects the house’s electrical appliances (and eventually you) by having incorporated within it either fuses or circuit breakers which automatically break the circuit if a fault occurs. Another safety device is the connection to ‘ground’ (known in some countries as the ‘earth’). This diverts any electrical leaks from exposed live wires safely to the earth rather than through you. For convenience and so the household circuit does not become overloaded, the consumer unit splits the current into circuits known as ‘rings’. The main division will be a ring for the house lighting and a ring for the power sockets. You may also have further subdivisions to give a ring for upstairs, downstairs, lounge, dining room, kitchen, electric cooker, shower units etc. Each ring will be designed for a specific size of current and will be protected by a corresponding size of fuse or circuit breaker. For example all the downstairs lights may be on the same ring protected by a 5 amp fuse, all upstairs lights on their ring protected by a 5 amp fuse, all downstairs sockets on the same ring protected by a 15 amp fuse, electric cooker on its own ring protected by a 60 amp fuse and so on. We will only be talking about the light ring main today, perhaps the others will be the subject of a further article some day. It must always be stressed that electricity is potentially fatal and care must always be taken when handling electricity and electrical components. If you are in any doubt that you are able to do the job or that you are unsure of what you are doing, you must always consult a qualified electrician and if necessary employ him to do the work on your behalf. In fact in some countries a non-qualified person is not allowed by law to work with electricity, in others the amateur is only allowed to carry out certain simple tasks. In the UK for example, a non qualified person is only allowed to wire an electrical plug and replace a power socket or light fitting or switch but not fit new items or install new wiring. They must also understand what they are doing. The electrical ring main for the lighting circuit runs around the house incorporating each light fitting and its corresponding switch. Each fitting has a ‘live’ terminal (in the US this is known as the ‘hot’ terminal), a ‘neutral’ terminal and an ‘earth’ terminal. Various countries have different colour coding for their electrical wires. In the UK the ‘live’ wire is coloured red, the ‘neutral’ is coloured blue or black and the ‘earth’ is coloured yellow with green stripes. In USA the ‘live’ wire is coloured black or red, the ‘neutral’ is coloured white and the ‘earth’ is either bare wire or green. Eventually I expect that all countries will standardise the colour coding but at the moment they do not. Because of this I will not be describing the wiring and terminals in terms of colour coding but in terms of ‘live’ (or ‘hot’), ‘neutral’ or ‘earth’ (or ‘ground’). Take great care with identifying different wires and always be sure you are aware of the purpose of each wire. Inset switches. Most modern houses are built incorporating electrical fittings and wiring as standard. For neatness recesses are built into the walls to house the wiring and rear parts of switches and power sockets. This allows all the dangerous parts to be enclosed and out of the way of probing fingers. All that is seen is the cosmetic front finger plate holding the switches and is made out of rigid plastic or decorated metal. The plastic can be coloured to match your home décor, likewise the metal front plate and switches are usually made from brass, chrome or some other ornamental metal. (Always be aware that if the front finger plate is made from electrically conductive metal, then there must be a wire connected to ‘earth’ or ‘ground’ in case of faults and the casing becomes ‘live’. Surface mounted switches. In older houses that were built before household electrical wiring was common and with stone walls too hard to cut recesses, the simplest solution is to use what are known as ‘surface back boxes’. These are, as the name implies, enclosed boxes fixed to the wall onto which the front finger plate is fitted. The wiring is completely enclosed within the box and if the box is made from a conductive material, there must be an ‘earth or ground’ wire attached. Both these types of switches use the same front finger plate; the only different is the back box. Once we have decided whether we are having surface or recessed switches we must then decide on the type of switch. Although they all may look the same when installed, the various light switches function in different ways and are wired differently. All the common types of electrical switch come in different styles. These differences are purely cosmetic and usually do not have any effect on the function of the switch or how it is wired, so we will be talking about a simple toggle switch. The single pole switch is the simplest and most common light switch. It is used to control an electrical appliance or light fitting from a single location. A characteristic of this kind of toggle switch is that it will have markings (usually a red colour or the words ‘on’ or ‘off’) to indicate when the switch is turned on or off. A single pole toggle switch has two brass screw terminals; one for the incoming current carrying (live or hot) wire and one for the outgoing current carrying (live or hot) wire to the light. Generally neutral wires are not connected to switches unless it is acting as a live wire in which case it will have a tab or colour attached to the wire. But this situation is best left to the professional as the amateur may become confused and unsure as to its purpose. This type of switch is for a single light which is controlled by two switches. The live feed from the distribution board connects to the terminal marked ‘common’ in the double pole switch while the wire from the neutral terminal runs to the second double pole switch via a separate 3 wire cable. The live wire from the common terminal on the second switch runs to the live terminal on the light. For more locations the wiring becomes even more complicated and I would recommend that a professional deals with this kind of circuit. Before you start the job, make sure you know exactly what you are going to do and ensure you have the correct tools for the job. Slot or cross head screwdrivers to fit the terminal screws. You will need to remove and replace the wiring at the electrical terminals. Screwdriver to fit the fixing screws on the finger plate. You will need to remove the front finger plate from the back box. Wire cutters and trimmers. You may need to trim or recut the electrical wires or their plastic insulation before connecting to the new light switch. Circuit tester. This is useful to check that there is no current flow through the wire (the circuit is dead) before you start to dismantle the old switch. Battery powered flashlight. Don’t forget you will have disconnected the lighting circuit so will not have the benefit of artificial lighting. Use a flashlight if it is too dark to see properly. 1. Turn off the power at the distribution board. Disconnect the power that is feeding the switch. To do this, find the distribution board (it may also be called the consumer unit or the fuse box or the breaker box). Depending on the age of the unit, there will be either a set of switches next to individual fuses or a set of switches controlling circuit breakers. Each switch or fuse should be labelled with the circuit it is controlling. You are looking for a lighting circuit feeding the part of the house where you are working on the switch. Next step is to disconnect the current from that circuit either by switching off and removing the fuse or by simply switching off the circuit breaker. At this point it is worth mentioning that if there is anyone else in the house, it would be wise to let them know what you are doing so they do not try to turn the current back on unknown to you. If you wish you can remove the fuse and put it in your pocket or put a sign over the switch. When you have disconnected the current at the distribution board go back to the old light switch and flip the toggle switch a few times to confirm that the light bulb does not illuminate and so current is not reaching the light fixture. A professional would at this point use a circuit tester to check whether there was any current flowing in the circuit. 2. Remove the old finger plate. Using a screwdriver remove the screws holding the front finger plate to the back box. Pull away the old finger plate from the back box taking care not to damage any of the wiring or its insulation. 3. Disconnect wiring and remove switch. Look behind the front finger plate at the electrical terminals and wiring behind. Check the condition of the wiring. If the wiring insulation seems old and cracked it may be time to have the wiring replaced. Contact a qualified electrician for a quotation on doing this job. If the wiring condition is ok, note which wire connects to which terminal and label one of the wires with a small piece of electrical insulation tape. Note that it is only the ‘live’ wire that is connected to the switch, the ‘neutral’ wire is not cut at all and the ‘earth’ wire is connected to the ‘earth’ terminal on the back box and on the switch if there is bare exposed metal. Pull the old switch away from the wall far enough to allow access to the terminals. You may find it useful to use the flashlight at this stage as you will probably be working in your own shadow. Unscrew the brass terminal screws and disconnect the wiring from the switch. 4. Install a new switch. If there is an ‘earth’ terminal on the back of the switch, connect the ‘earth’ wire to its terminal as well as connecting to the ‘earth’ terminal on the back box. This is in case of a fault and the switch finger plate becomes ‘live’, current is channelled to ‘earth’ via the wire rather than through a human hand. Connect the two ‘live’ wires to the terminals on the switch. Ensure the correct wire connects to the corresponding terminal that was on the old switch. If you switch these wires around so they are on the wrong terminal then the operation of the switch will be reversed. Gently tug on the wires to make sure the copper is suitably clamped by the terminal screw. Check all terminal screws are tightly screwed in and check that all the copper strands that make up each wire are all within their corresponding terminals. If there are any stray strands and they touch another terminal, you will have a short circuit and the fuse or circuit breaker will operate thus breaking the circuit. Gently push the switch so the wiring is gathered into the back box and none of the wire is pinched or folded too much. Fasten the front cover finger plate to the back box with the fixing screws provided. 5. Turn power on. Return to the distribution board and re-insert the fuse if you have removed it. Flip the toggle switch to turn the current back on. Be aware of any circuit breakers tripping out that might indicate if the switch is installed incorrectly. Go back to the replaced switch and flip it to turn the current on and off. Notice if the light works as it should. If you notice that the switch seems to be reversed i.e. the switch indicates ‘on’ but the light is off and if the switch indicates ‘off’ but the light is on, then you have incorrectly wired the switch and it will have to be redone properly. 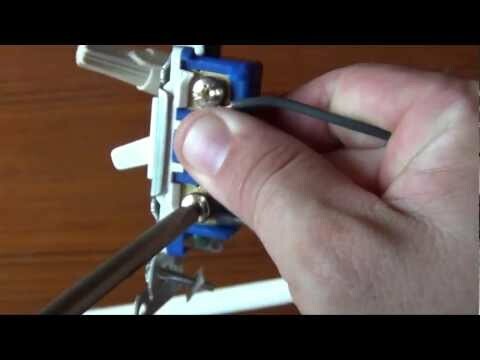 The method of replacing a double pole switch is exactly the same as the single pole with the exception that there will be more wires in the back box and connected to the switch. As long as you take note which wires go to which terminal and copy this arrangement to the new switch, everything should work correctly. Safety is very important when dealing with electricity and electrical components. Electrical devices can be lethal if the wiring is not done correctly. The following general safety considerations must be followed at all times when dealing with electricity. Do not overload your circuits with more and more appliances and electrical devices. A circuit can only cope with the current flow it has been designed for. If your house was built in the time when the only electrical devices were one light and one socket per room, then it is certainly not safe to overload. See a qualified electrician to determine if the existing circuits are safe for your purposes. If your lights flicker or you have switches that are hot to touch then you have problems. Sizzling noises in the switch means that it is time to have it looked at. It may be a faulty or an old switch in which case it will need replacing or it could just be that the wires or terminals have become loose in which case it is just a matter of tightening the screws. Be sure to use ‘earthed’ switches and check the electrical load on the switch. If the circuit is protected by a 20 amp fuse in the distribution board then use a 20 amp rated switch, not a 15 amp. If any of your electrical appliances and devices has given you a tingle or a jolt when they have been touched, ensure that the ‘earth’ wire is present and it is connected to its terminal. If it isn’t and there is a fault with the appliance then you may have an ‘earthing’ problem and the current is trying to discharge through you rather than the ‘earth’ wire. Always check that the appliances on a specific circuit do not draw more current than the circuit is designed to handle. Look in the fuse box or breaker box and see what rating the fuse is set at, look on the outer sheathing on the wire and see what its rating is. If you are continually resetting breakers or replacing fuses then there is likely to be a fault and more current is trying to be drawn than the circuit is designed for. If the problem continues then you are likely to have an electrical fire. Get it inspected by a professional. In places where there is a lot of moisture such as bathrooms, garages, basements and outdoors, fit ‘earth fault circuit interrupters’ or ‘residual current breakers’. If there is a difference in potential within the circuit the breaker will operate and open the circuit preventing you from being electrocuted. Light bulbs can be a problem if their wattage is too large for the socket. This can cause the socket and wiring to overheat and any lampshades to be at risk too. Loose connections between the bulb and socket terminals can cause overheating and lead to insulation breaking down and electrical fires starting. It is a good idea to replace old fashioned incandescent light bulbs with fluorescent bulbs or better still use LEDs. These use less power than traditional bulbs and last a lot longer. Electrical plugs fitted to appliances can be a problem if the flexible cord becomes damaged. Check for cuts and chafes. Electrical plugs should always be fitted with an ‘earth’ pin. In the US there are still many two pin wall sockets, in the UK all wall sockets (except electric shaver points) and appliance plugs are three pin, one of which is an ‘earth’ pin. If the socket or plug shows signs of damage or scorching then it is time to replace. Defects with electrical wiring and connections always cause electrical fires. Ensure all connections are tight. Light bulbs should be chosen to match the socket’s rating and any strange noises from the switch or light fitting must be investigated immediately. Turn that circuit off and call a licensed electrician. When working on electrical sockets or switches always disconnect the electricity in that circuit and make sure it cannot be re-connected accidentally. If you are not sure how to do the job, call a qualified, licensed or registered electrician. When you are weighing up the pros and cons of DIY electrical work, the only reasons for doing the job yourself is to save money and have the satisfaction of doing a good job yourself. BUT… this must never be at the expense of safety. It is surprising how many people who like DIY will attempt an electrical job without really knowing what it is they are doing. There is nothing wrong with their workmanship, it is just that they do not know enough about electrical work to be able to determine what they can and cannot do. A professional electrician has done electrical repairs for many years and knows how to do a job safely. Poor electrical outlet work is the cause of most electrical fires in the home and poor electrical work is mainly done by amateurs. While it is true that most people can safely re-wire a plug and there is no need to call an electrician for that one, any tasks more complicated than that, including fitting replacement switches; would be better left to the professional unless you know exactly what you are doing. Professional electricians have to train for many years as an apprentice and gain qualifications at college. Once they are in industry they have to study and pass further qualifications to certify that they have the knowledge to work on domestic circuits. They must continue with their professional development and learn about all the new technological improvements to continue being registered. How can you compare that with someone who is just ‘having a try with DIY’? I would always recommend that electrical work is done by a professional and in fact your home insurance may not cover you for any damage caused by amateur electrical work. Some countries have laws that require all electrical work be done by a registered professional, so you may be committing a criminal offence if you do any electrical work yourself. Always check with your local planning department to find out any relevant regulations. Most households are heavily reliant on electrical devices, lights and appliances. As a general rule houses are not supplied with enough power sockets or switches for additional lighting. Rather than use extension cables it is better to extend the circuit and install additional sockets correctly. Additional wiring or rewiring Depends on amount of wiring to install but an electrician will usually charge about $70 to $90 per hour. Electrical tasks around the home range from simple ones that almost anyone can do such as changing a plug or a light bulb, to more difficult jobs such as replacing a light switch or power socket which would be suitable for someone who is an experienced electrical DIY person. Anything else more complicated than this should always be left for the professional. Make sure you disconnect the current from the circuit before starting. Choose a replacement switch with the same number of poles as the original. Always rewire the new replacement switch using the same corresponding terminals as are on the original switch. Make sure the wire is pushed fully into the terminal and the clamping screws are tightly wound ensuring there is no movement. Check there are no stray wire strands in contact with another terminal. Always make sure you have plenty of light so you can see what you are doing. If you have any doubts at all as to whether you can do the job safely, call in a professional registered electrician, who can provide you with a warrantee for his work.